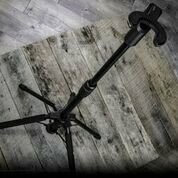 D&A products enhance the safety and security of your instruments, and the Starfish Passive Guitar Stand is no exception. The Starfish stand features five wide-stance angled legs and has been tested to endure over 30 degrees of tilt without tipping over. There's no danger of the head's yoke marring your guitar's finish, thanks to D&A's Grip Friction System, comprised of over-molded soft nodules of thermal plastic elastromer (TPE), a polymer that's safe for all guitar finishes and virtually eliminates the possibility of slippage. The Starfish's height can be adjusted with a single knob, accommodating instruments of almost any size, and the whole stand folds down quickly to around half its regular size for enhanced portability.